Okay, get your pooper scoopers ready as Genesis Gaming are taking you for a walk with your pet mutts for A Bark In The Park! 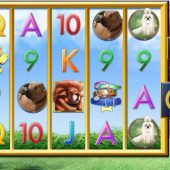 There is a gentle classical music backdrop to this 1024-way slot over 5 reels and 4 rows and naturally the pampered pooches make up the prime symbols along with the standard card letters and numbers. The card symbols are stacked in various amounts of either 1, 2 or 3 rows high. The dog symbols are either single or in stacks of 2 but it is possible to get 3 in view on some reels simultaneously. The fluffy brown dog (which looks more like a lion!) is the top - paying symbol at 7.5x stake for 5-of-a-kind. This sounds low, but bear in mind it is feasible to get tens of combinations due to the stacks. There is a Wild symbol with no multiplier on reels 2, 3 and 4 in the form of a pile of coloured dog collars. You do get golden paw prints on all reels and 3 or more will produce 8 free games, up to 20 for all 5. You can retrigger them or just 2 further scatters will add 5 extra free games (I think you know where this is going.....) and the Wilds when appearing in a win become cumulative multipliers randomly giving a 2, 3 or 4x multiplier. If all 3 appear then it is possible to have a 64x multiplier on any 5-of-a-kind wins in the bonus.